A strikingly good looking yacht and one for the true connoisseur, this beautiful passage maker is based on the Bowman 49. 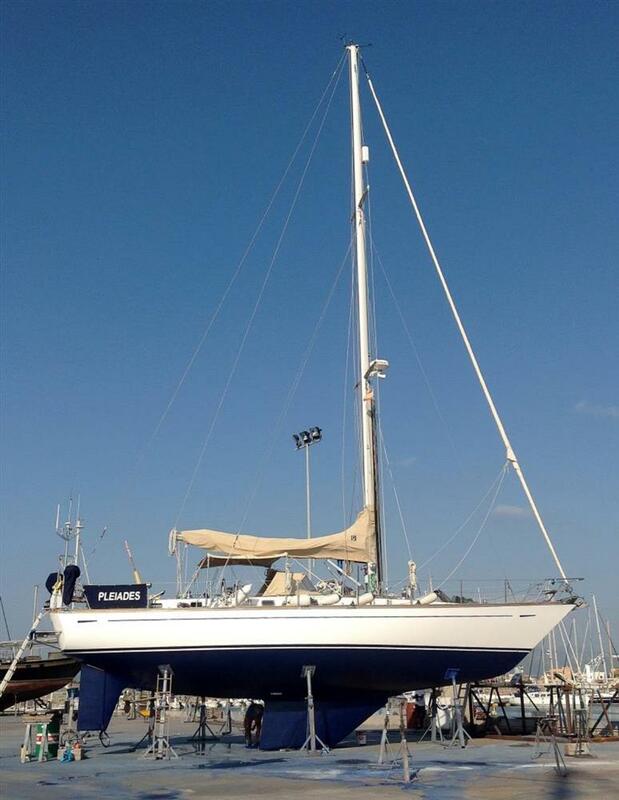 Known to us and sold by us in the past, she has since been upgraded with an all new electronics and navigation package, plus some additional new standing rigging and safety equipment. 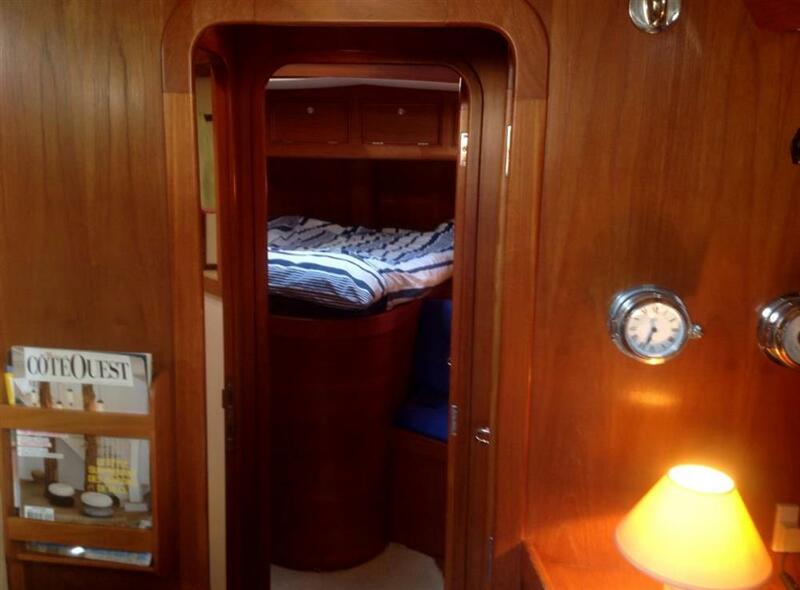 She is a centre cockpit yacht with a large double aft cabin, a single berth with pullman over passage cabin, two heads and a large fwd double cabin. 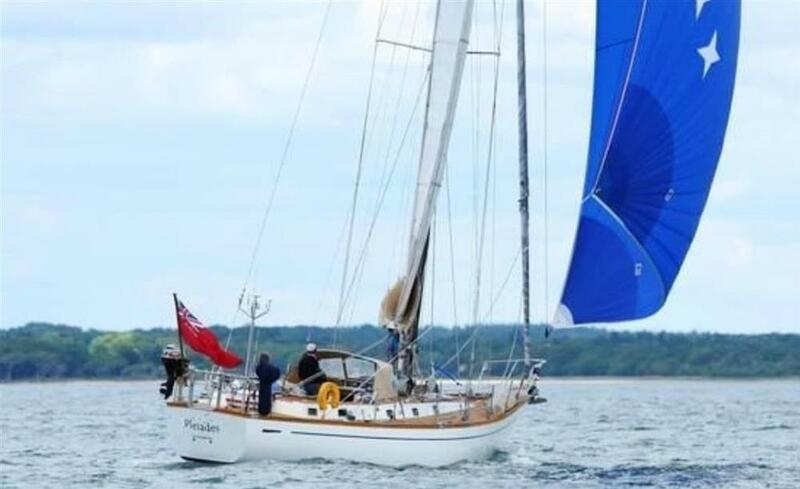 One of only two of her kind in existence, Pleiades with her Holman & Pye lines is a real beauty and a delight to sail. The first was ordered by a Norwegian gentleman from Bowman, he liked the Bowman 49 but needed extra headroom so they altered the moulds to accommodate this. This resulted in the overall length going from 49ft to 50ft. And he certainly got his extra headroom throughout. 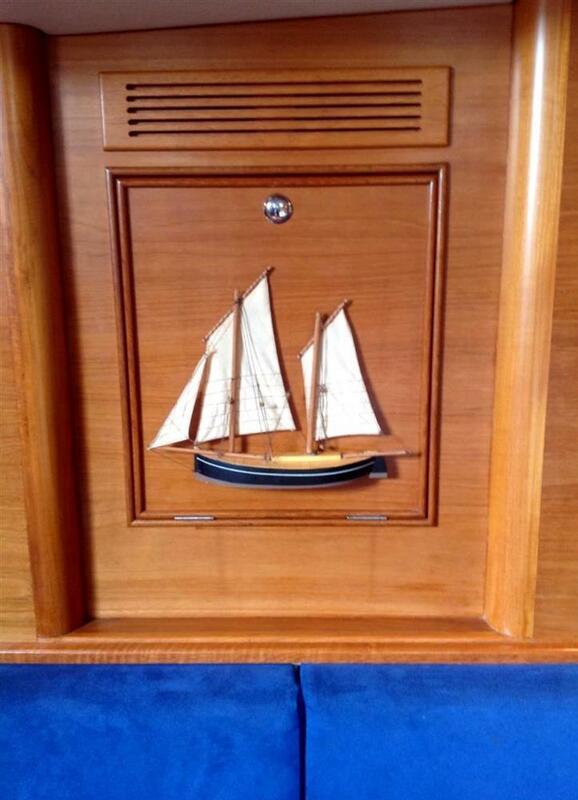 The builder and first owner of Pleiades, Jolyan Wilde, bought the moulds of the Talisman and had the hull and deck moulded. 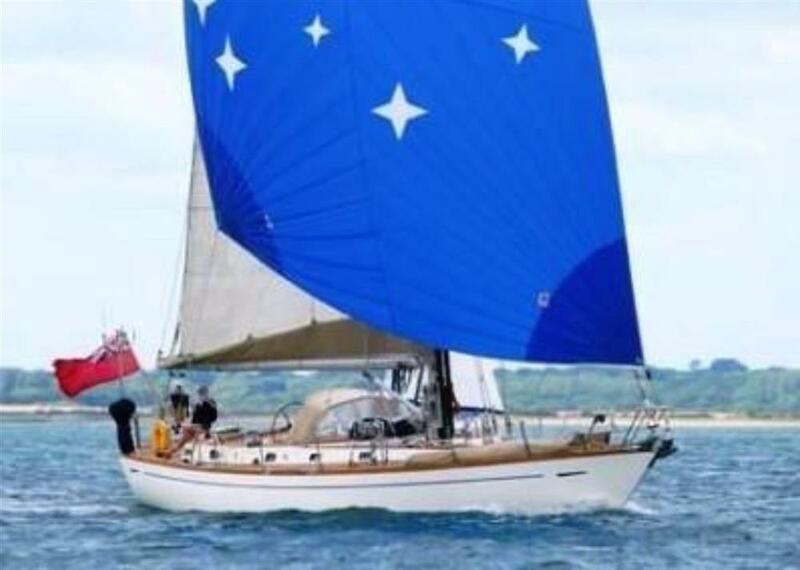 She was then fitted out by him and craftsman David Skeene in a building shed at Moodys Boatyard on the river Hamble. 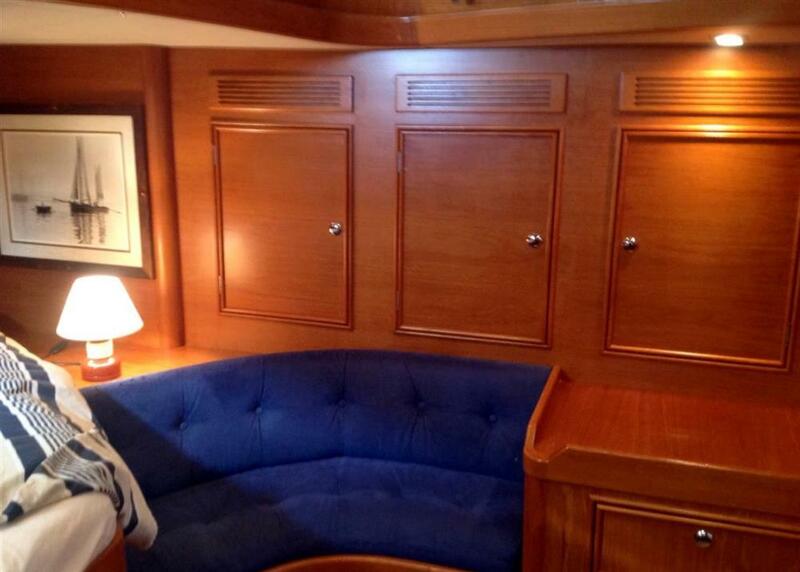 She was built to the highest standards using only the best of materials, equipment and high quality interior joinery. Most of the deck fittings are custom made as are the stantions and bases. 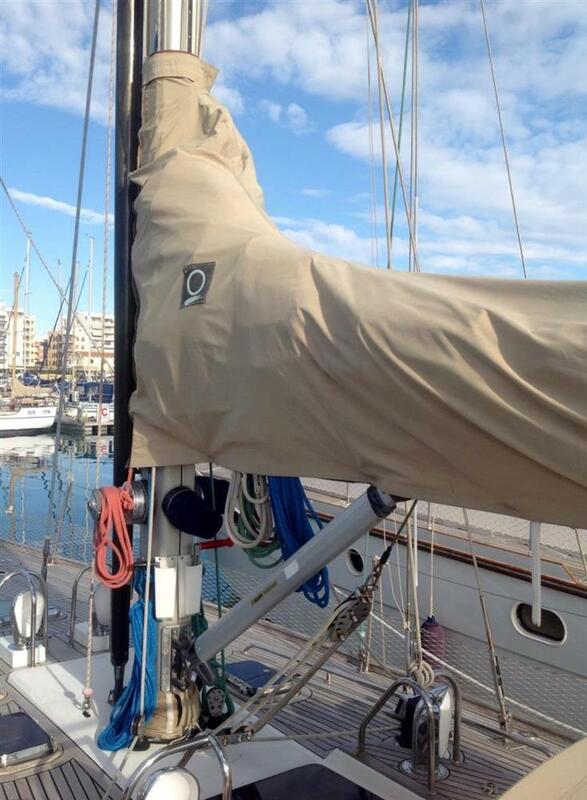 The scantlings are oversize in all departments from the hull layup through to the mast and rigging. Max Prop with rope cutter fitted. Proctor mast fitted with Ronstan Cars. 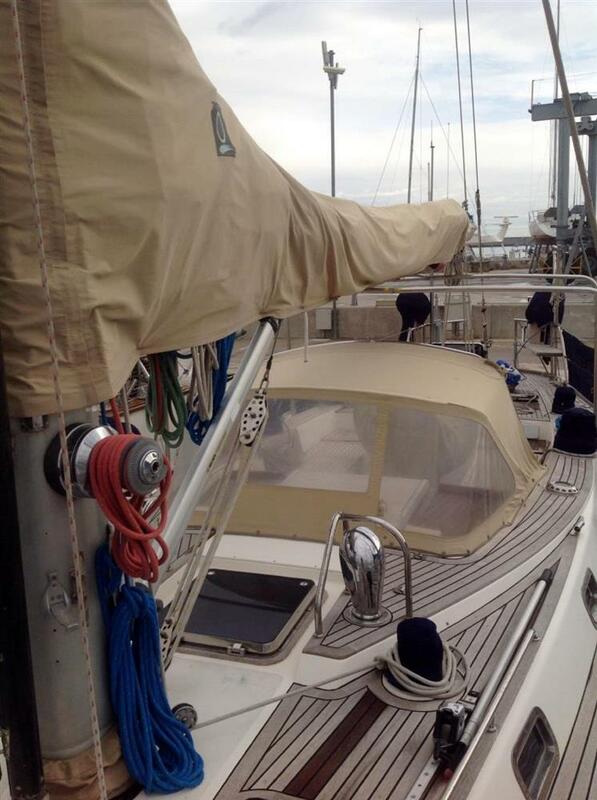 Twin carbon fibre spinnaker poles. Pleiades is a strikingly attractive yacht, she gets heads turning wherever she goes. She has beautiful lines and lovely sweeping decks. 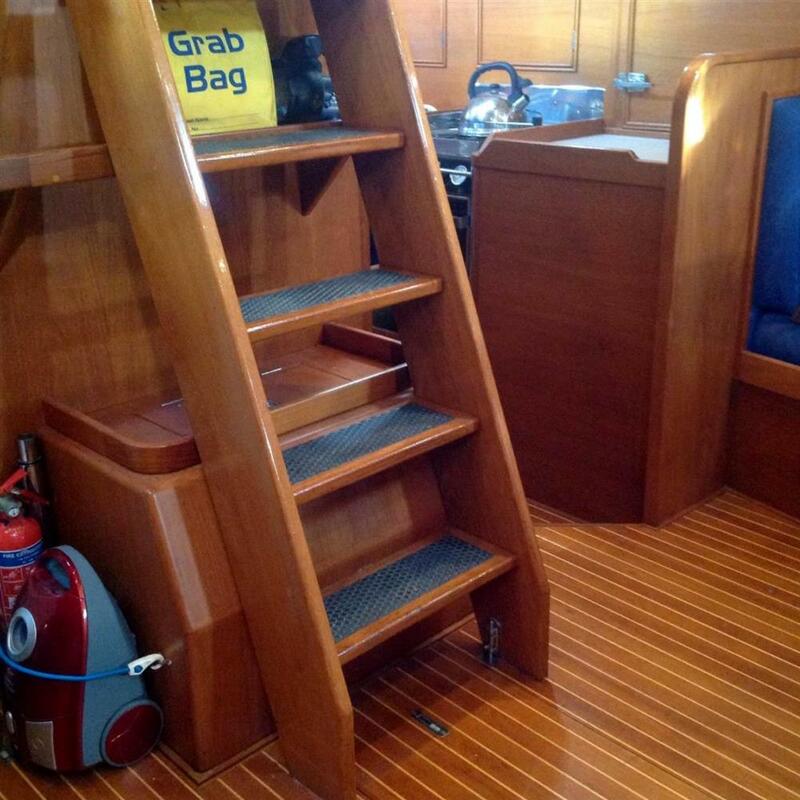 Her teak decks are always being commented upon. 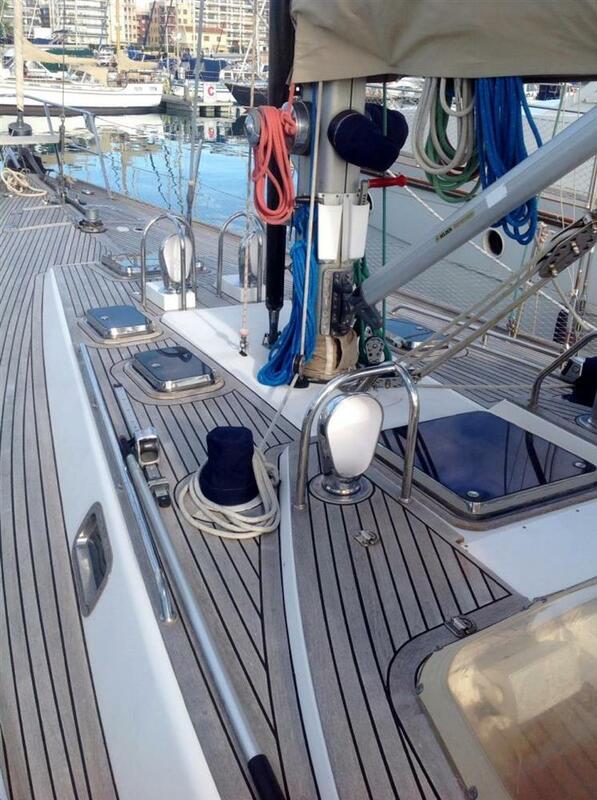 Unlike a lot of modern yachts all the deck area is usable. 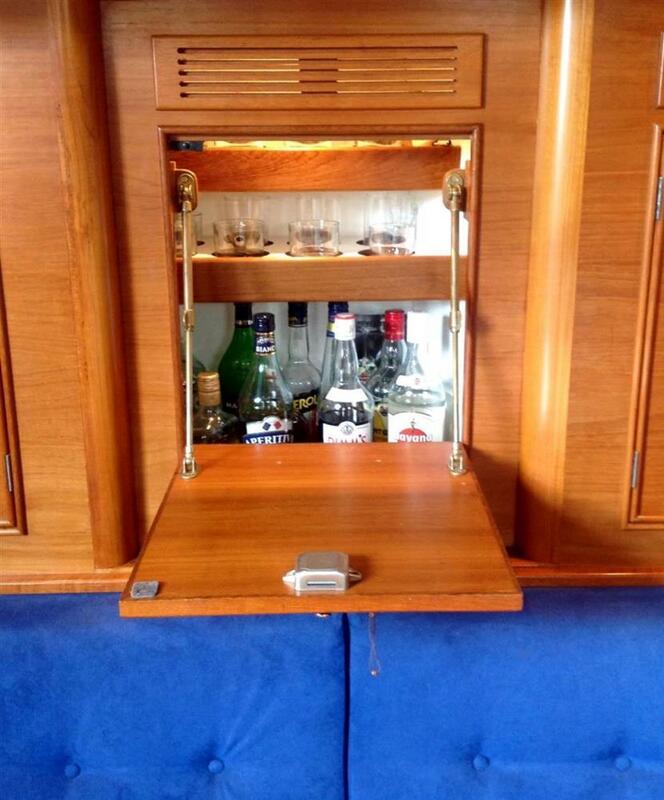 She has a centre cockpit which seats six or ten at party time. The cockpit seats are long enough and wide enough to sleep on- very nice in the summer months. 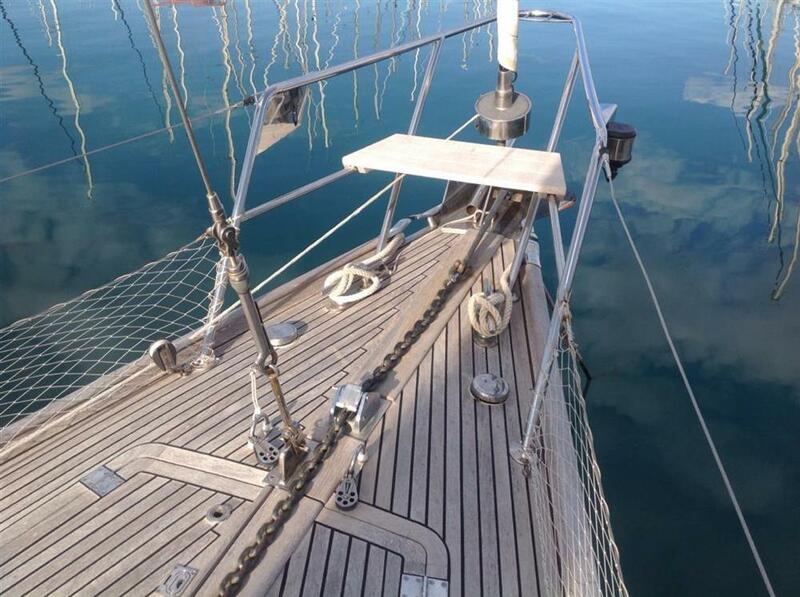 The cockpit table folds away while sailing. 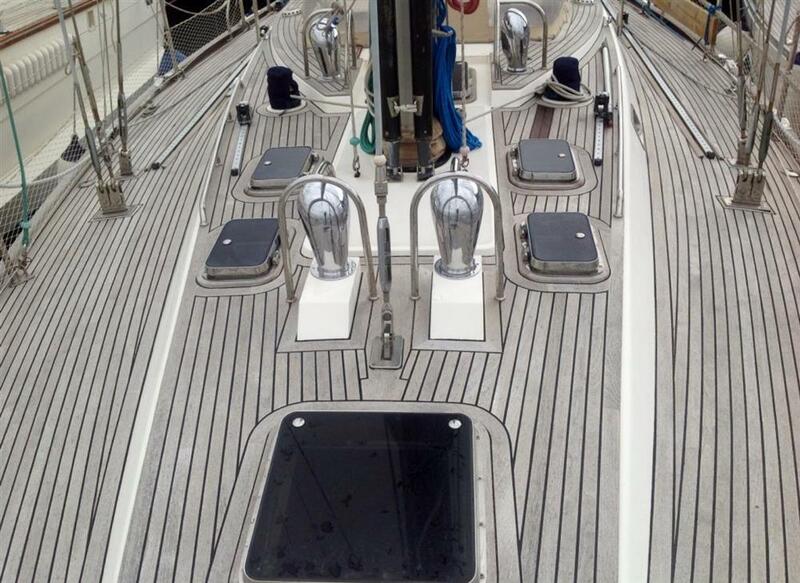 From the helm position there is excellent all round visibility even with the bimini in position. 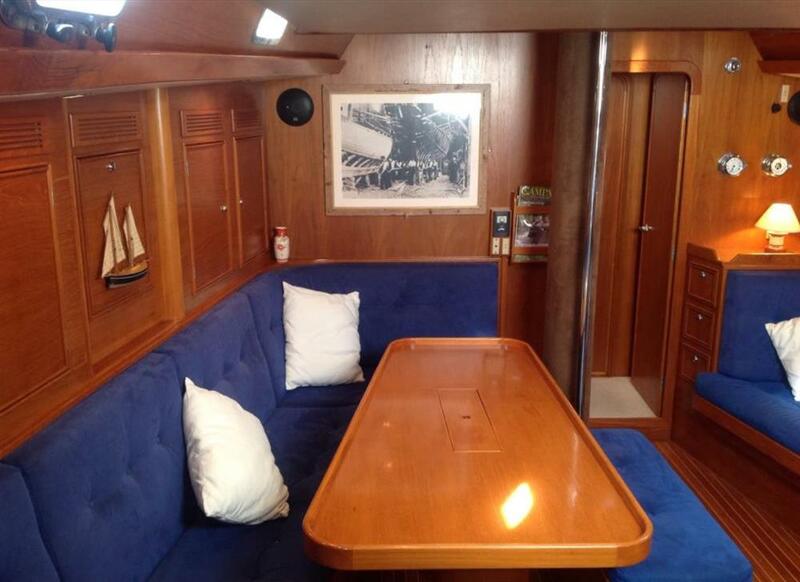 From the companionway into the large saloon with its offset dining table to seat six with comfort. 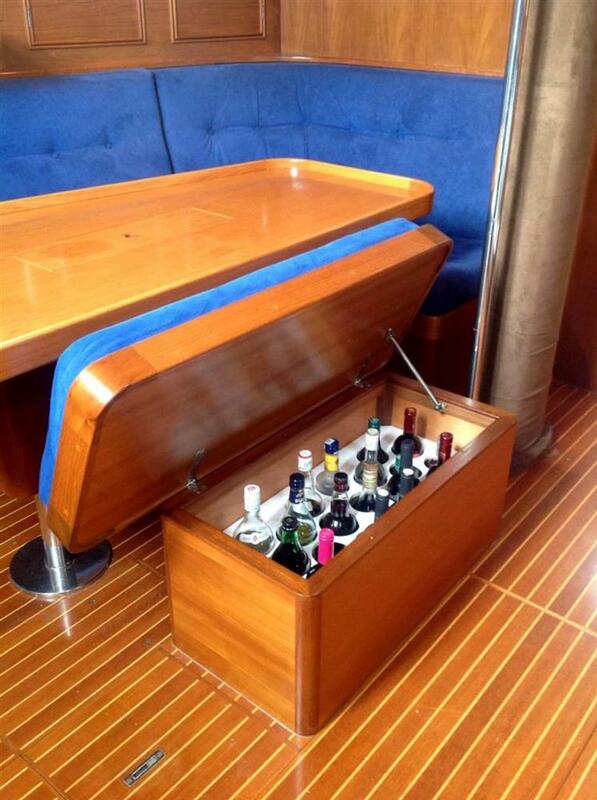 There is an island seat that happens to also be a bottle storage and another bench seat to starboard. Lots of storage and drawers for all those bits we just need. To starboard is the navigation station. Good sized chart table with storage under. An insert lifts up from the table lid to reveal the Dell computer which runs the Seapro navigation system. Radios and other equipment are at fingertip range. Just aft of the navigation area is the ‘bosuns cabin’. Single berth with Pullman above. 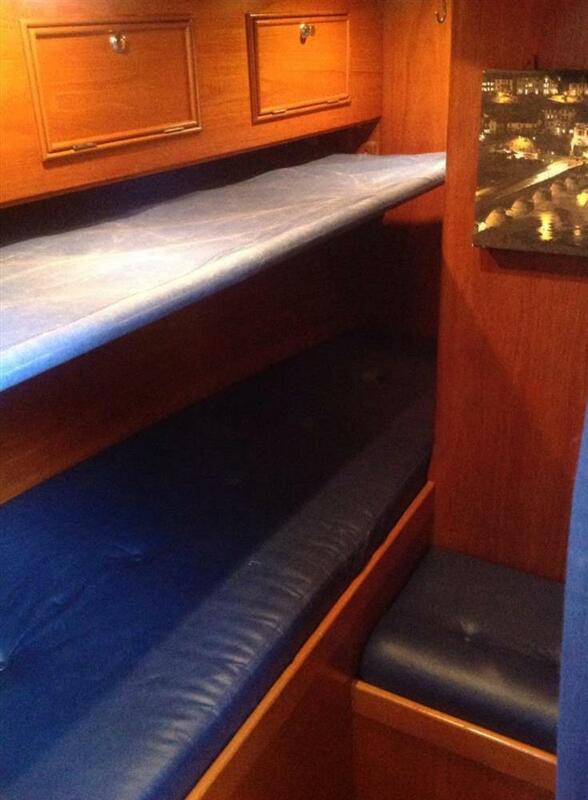 Overhead stowage and wet locker. 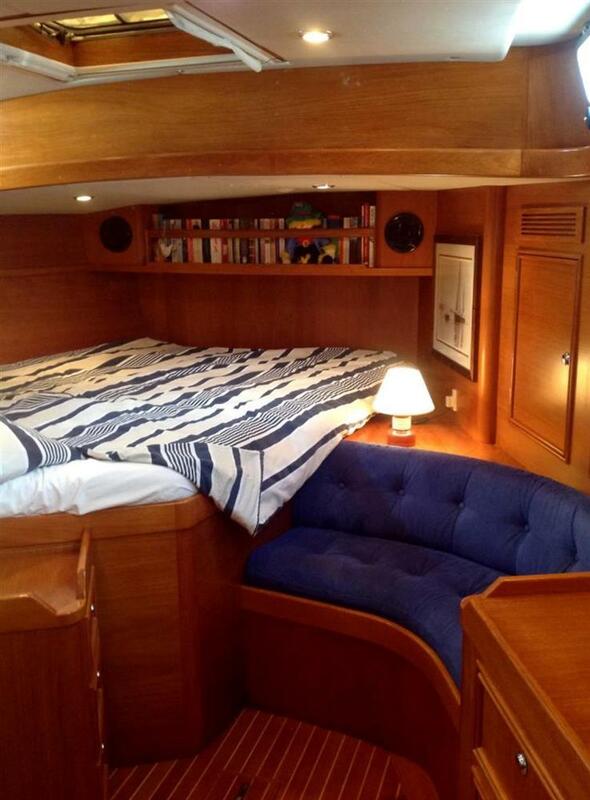 The perfect sleeping spot when on passage. 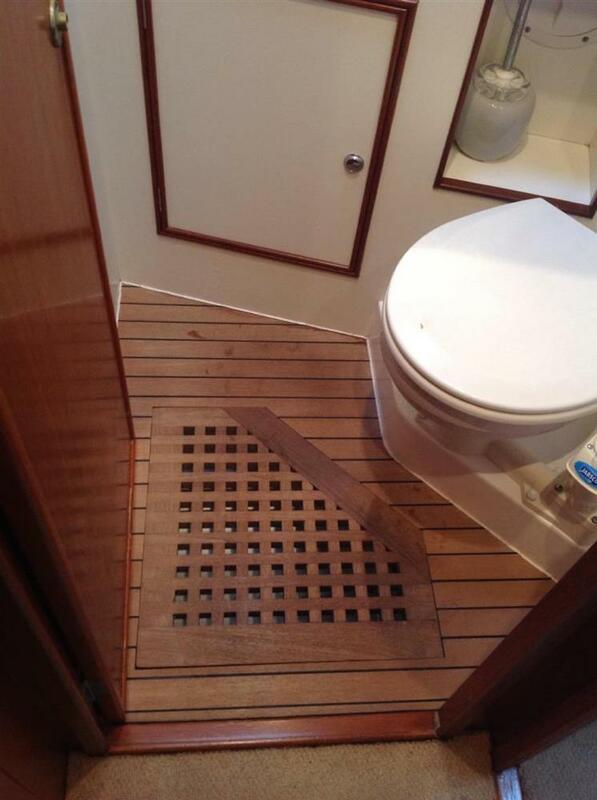 Access under the seat to the hot water tank. Stowage under the berth. 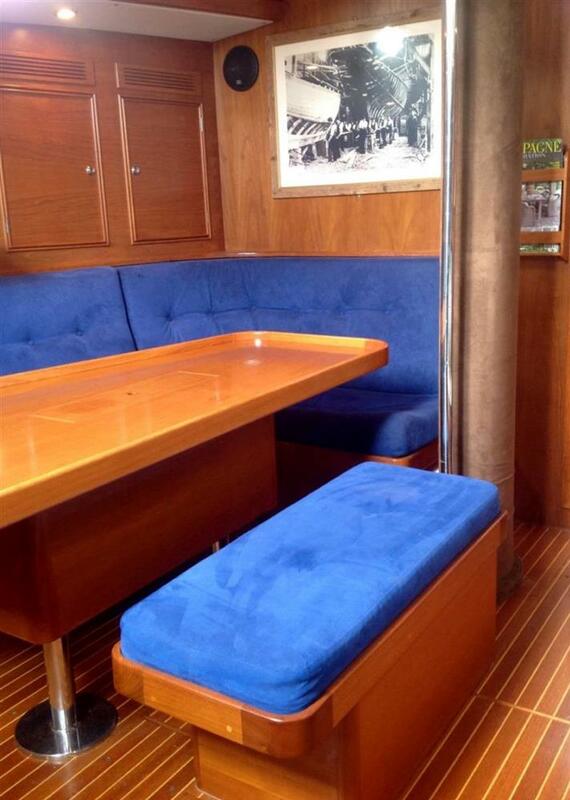 From the port side of the saloon going aft is the longitudinal galley. Once again perfect for passage making-very little boat movement. With fridge and freezer also a built in cool box. Just add ice to a stack of beers and wine on those hot summer days. Next to the double sink is the Force 10 stove, with three burners, oven and grille. All the burners have been replaced since 2012. 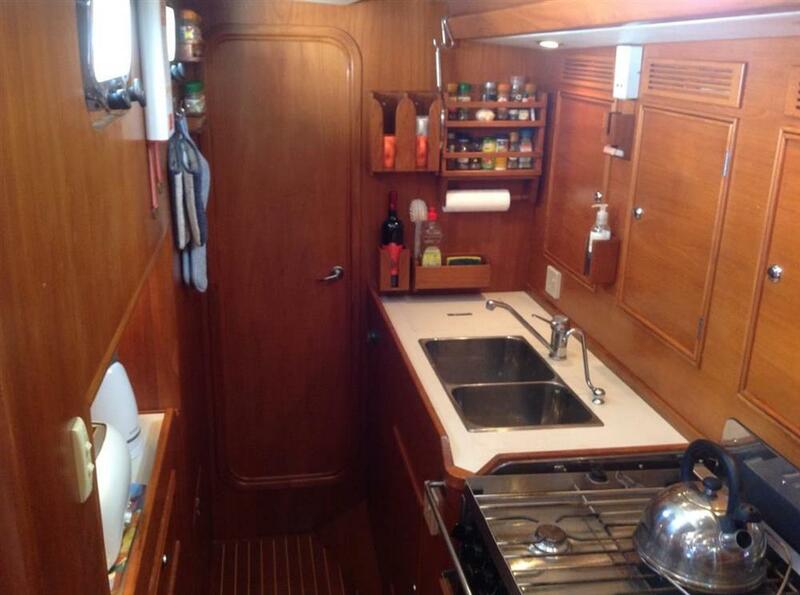 Lots of stowage under the work top and behind the sink etc. There are various racks for all manner of things. The gas alarm with its on/off solenoid switch is located above the sinks and has two sensors below. This was new in 2009. 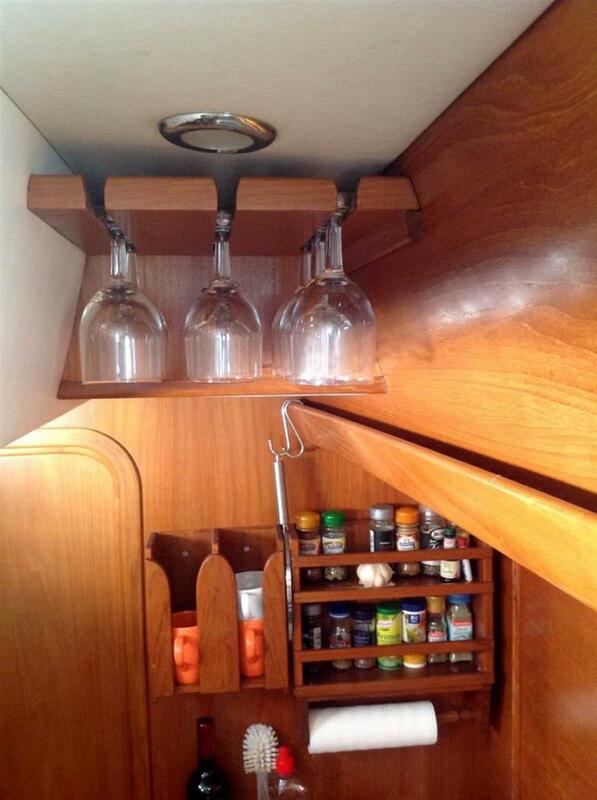 Continue aft through the galley to the owners cabin. Offset double with hanging wardrobe, drawers and stowage lockers. Heads compartment with Jabsco manual toilet ,new in 2009. 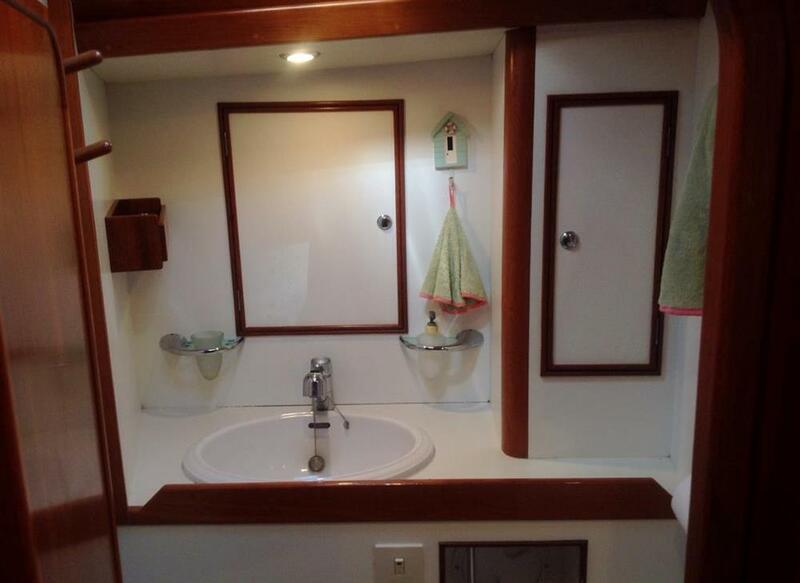 Stowage lockers, mirror, towel rail etc. Separate shower cubicle. Forward of the saloon is an area we call the ‘lobby’, storage and an extra area that can be used by the fore cabin if needed. 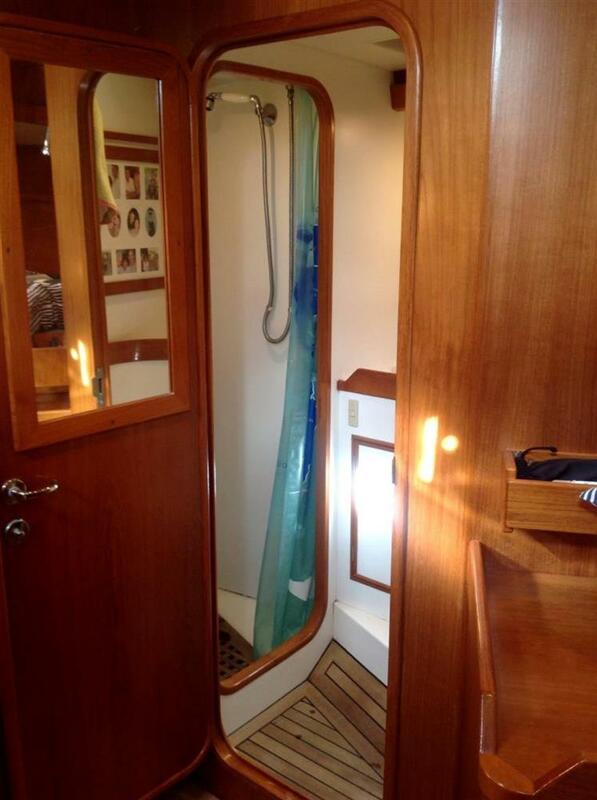 From the lobby to port is the second heads and shower unit. 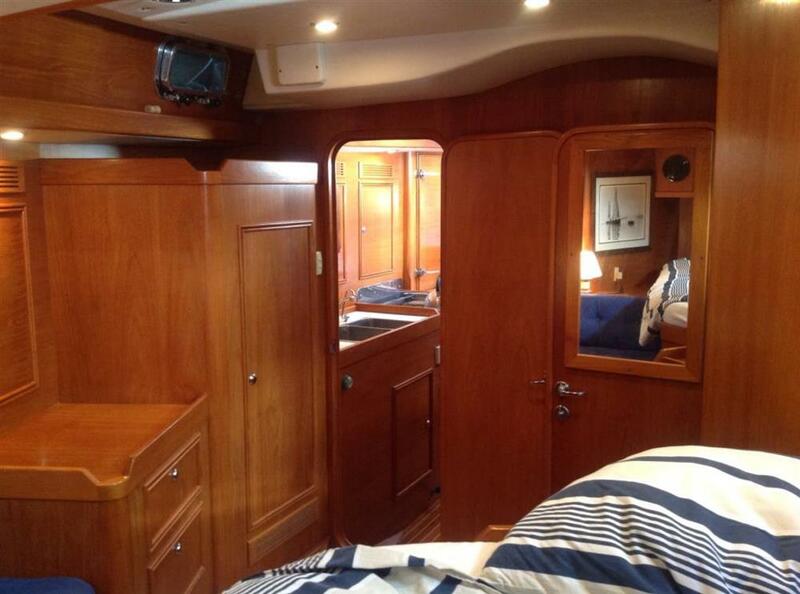 Forward is the second double cabin with hanging locker and good storage. 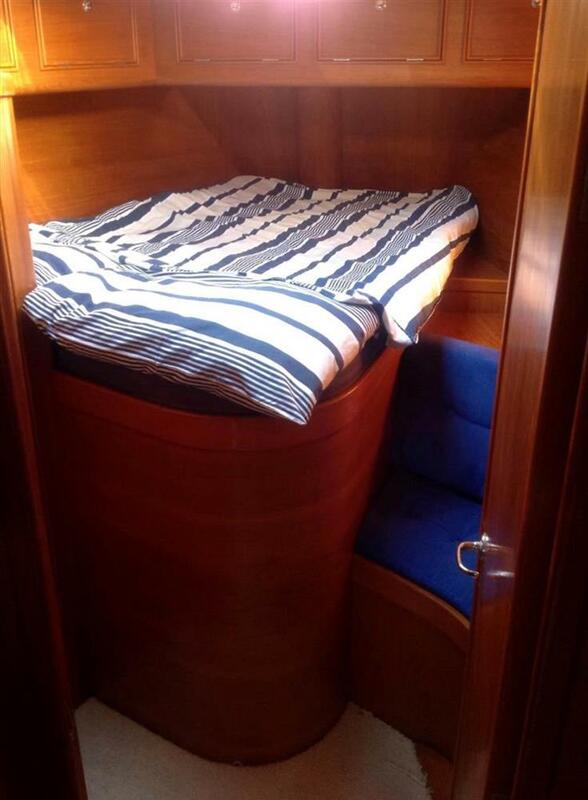 There is excellent storage under the berth. The chain locker is also accessed at this point. Throughout Pleiades the joinery is excellent, there are plenty of lights when and where you need them, very good headroom, top quality fittings and equipment. All in all she is a wonderful craft. 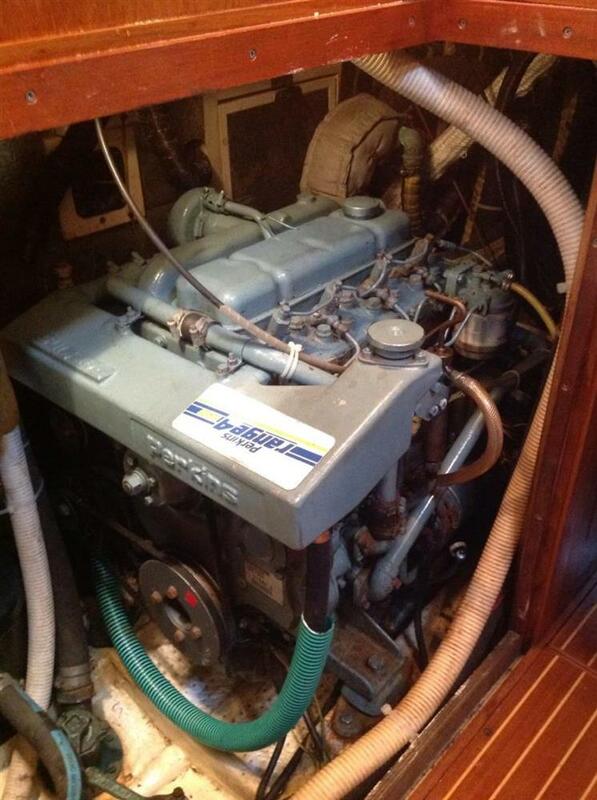 Engine; Perkins M90, 85hp, Circa 3440 hrs. Fitted with two alternators 12v and 24v. Generator; Northern Lights M673 (2010) 556 hours. 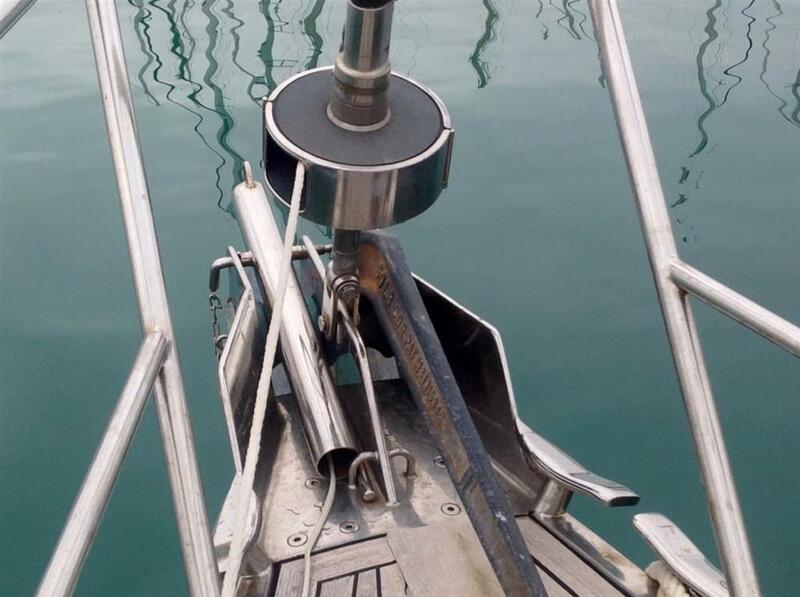 Stainless steel shaft through cutlass bearings, bronze P bracket. 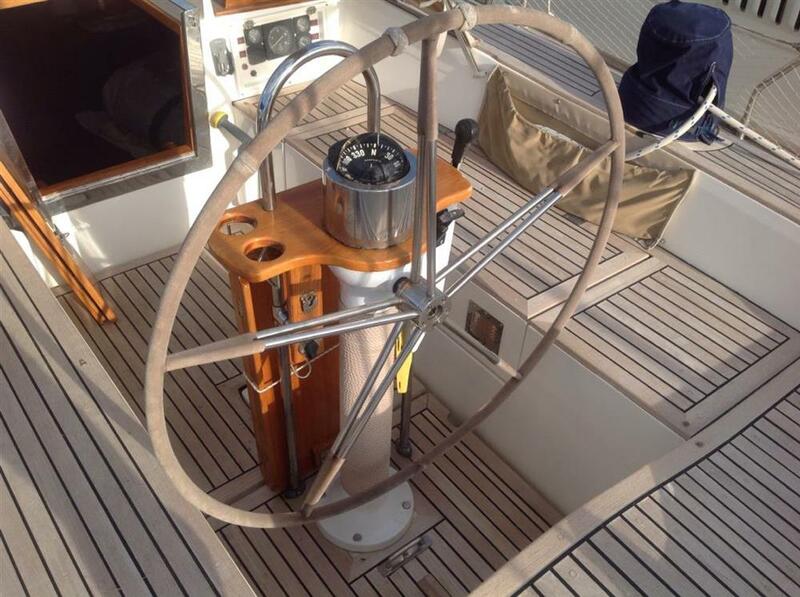 Edson wheel steering system, stainless steel wires through bronze turning sheaves to bronze quadrant. Grease points fitted. Lawrence Globalmap 5300- using Navonics chart system. 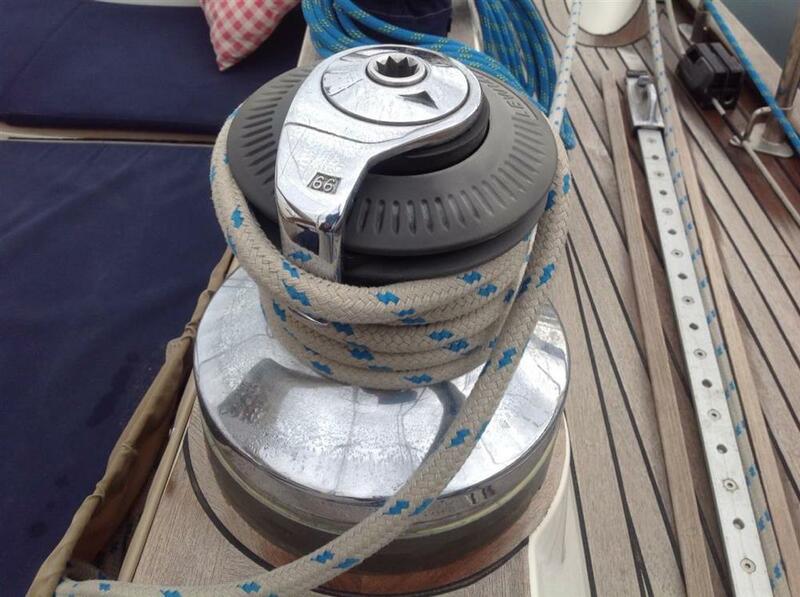 Lewmar 2000 24volt deck windlass. 102 meters of 12mm galvanised chain. 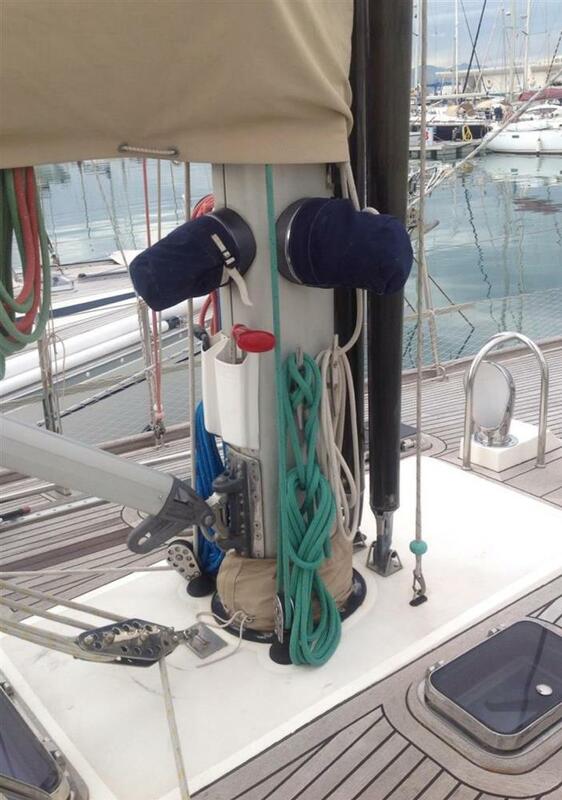 Aft deck communication mast- TV aerial, AIS, Emergency VHF, Navtex, GPS. 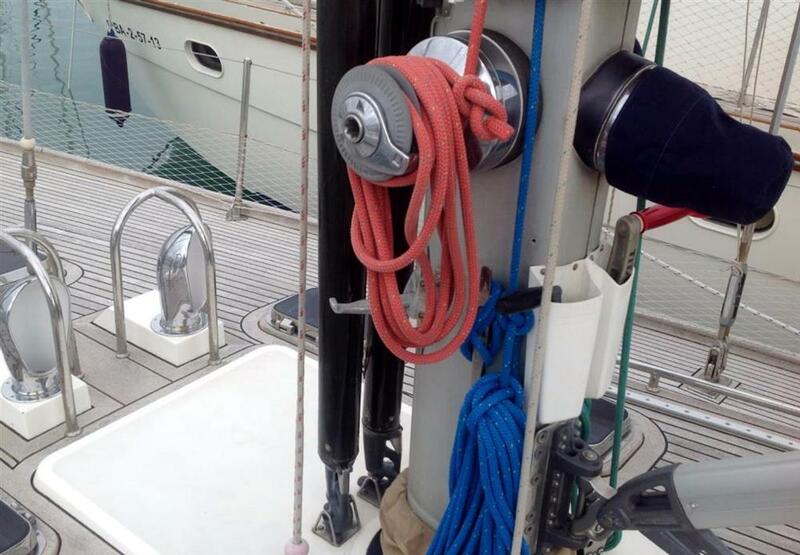 All deck hatches and port lights are of stainless steel. Bathing platform with built in bathing ladder. 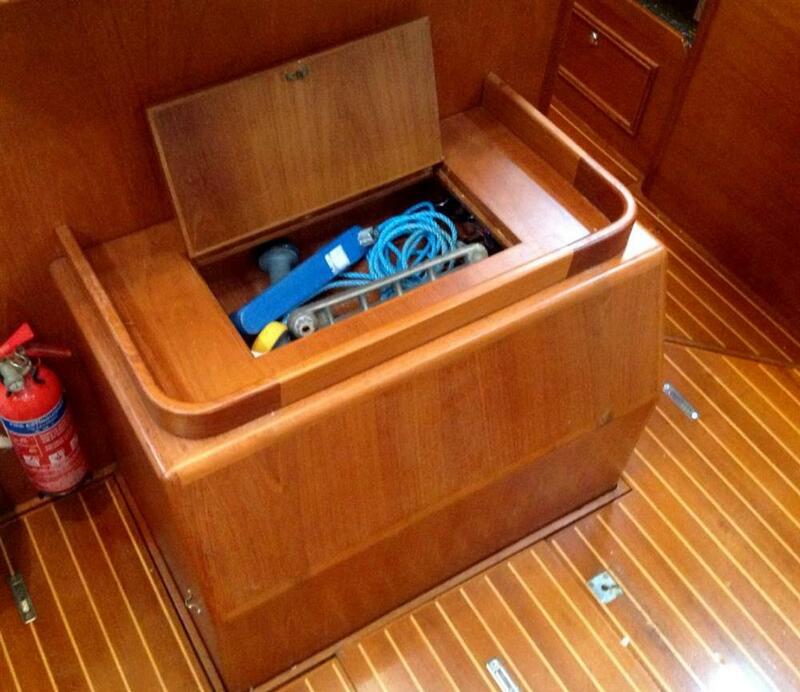 Large lazarette with own auto bilge pump. 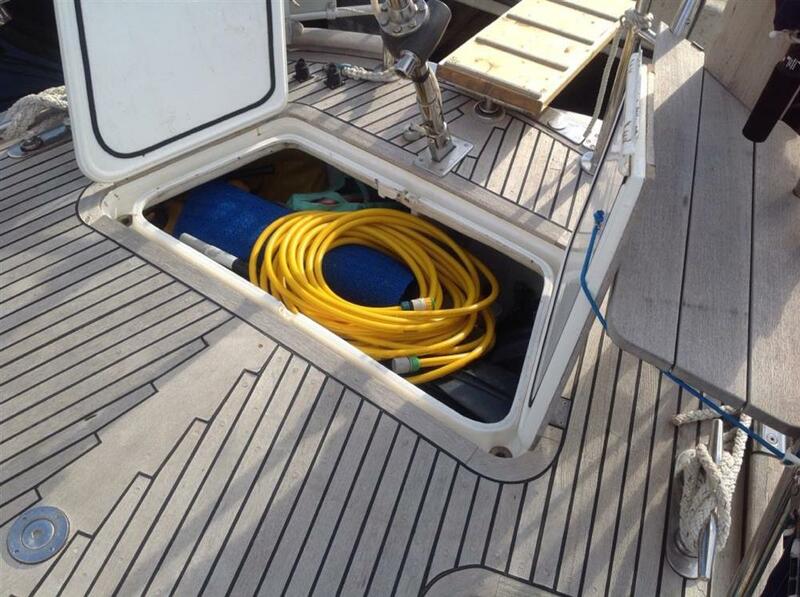 Black water holding tanks (two) with electric pump through hull discharge or, deck pump out. Four 220ah AMG, 2010. Domestic 24 volt and navigation systems. Two 100ah acid, 2012. Engine start and 12volt systems. 240volt shore power with domestic sockets throughtout. Auto fire extinguisher in engine room. 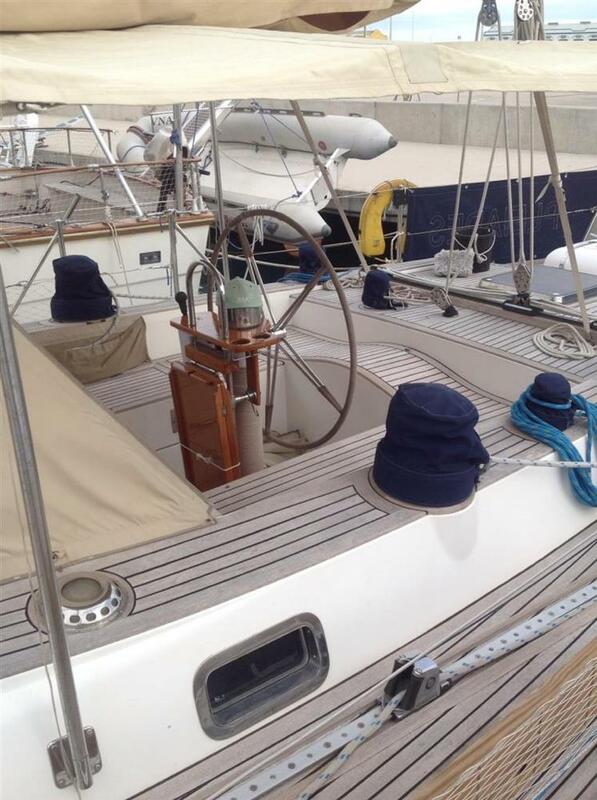 She is a delight to sail, her Holman & Pye design giving he wonderful seagoing characteristics. 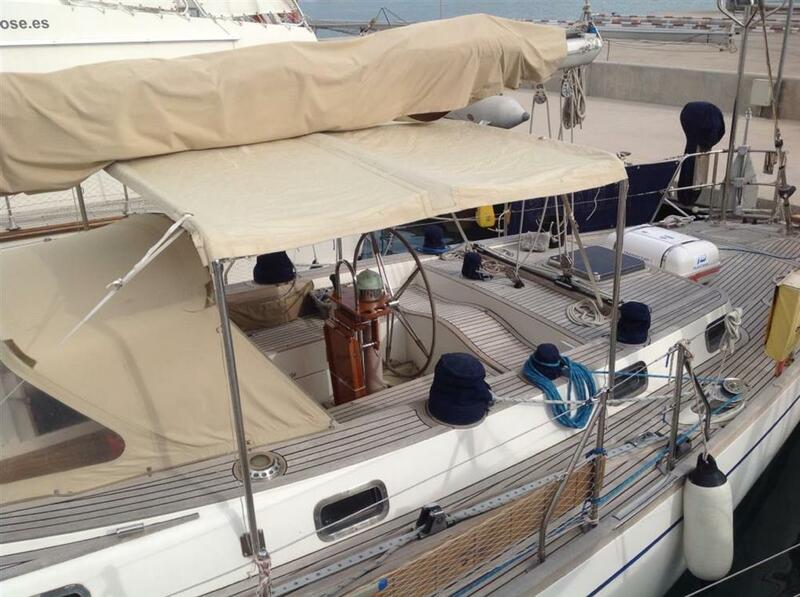 She is a big heavy yacht that looks after the crew extremely well in all conditions.